Most of the talk about throttling video over cellular networks has been traditionally directed towards the wireless providers themselves: AT&T, Verizon, etc. But who would have thought Netflix was behind the lower-quality streams? Made public on their blog, Netflix has admitted to capping AT&T and Verizon customers at 600 kilobits-per-second — a bit rate that would be considered low for streaming 480p video not to mention HD (720p). But Netflix claims their research shows customers don’t need the same resolution on their cell phones as they do large TVs, and that the capping “hasn’t been an issue for [their] members.” Those of us who tried casting to large TVs from phones while on cell networks, however, were quickly discouraged by the lack of quality. Instead of wrongdoing, Netflix packaged the blog post as “helping” their members. They said capping the streams helped customers not to exceed their data limits (which, most of you know can bust your bank accounts if not monitored), and that the 600Kbps cap was a good balance between video quality and data usage. In the post Netflix also says they are working on a “data saver” feature for mobile apps that will let users take more control over streaming on cellular networks. In effect, it sounds like users will be able to control (to some extent) the video quality they watch depending on their data plan. But even with unlimited data plans (for example AT&T’s new unlimited plan for DirecTV/AT&T customers) streaming video over mobile networks devours data. AT&T’s unlimited plan, for example, starts capping subscribers when they’ve reached 22GBs used. 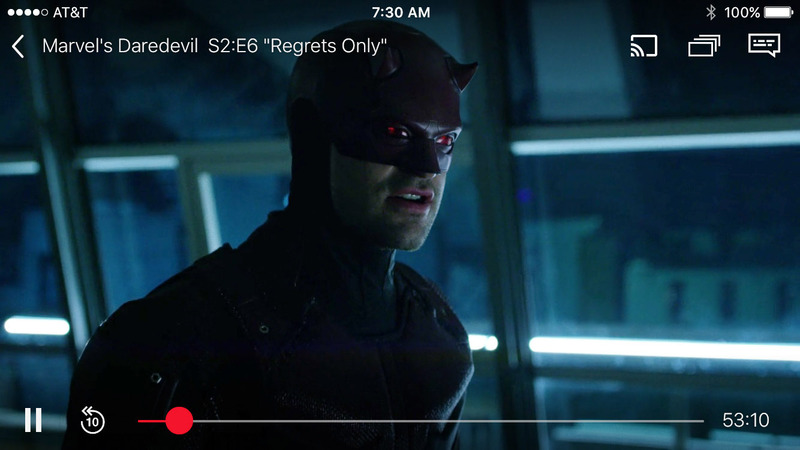 Is that enough to stream the entire new season of Marvel’s Daredevil? Netflix hopes to roll out the new data saver feature in May.